Eliminate confusing mix charts, mixing errors and waste! 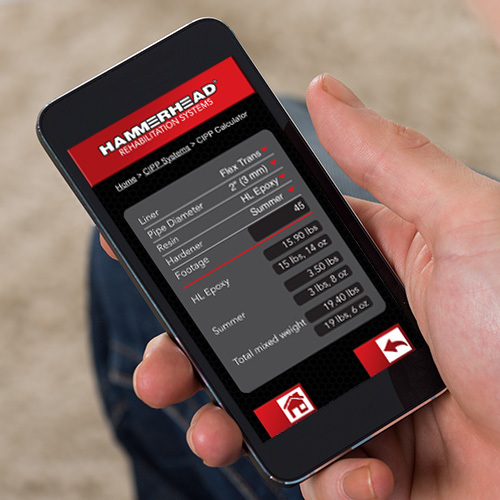 Use the FREE Rehabilitation Systems Mobile App from HammerHead®Trenchless to easily determine mixing ratios and cure times. Simply enter your project specifications into the app and it will tell you exactly how much resin and hardener you need to mix. It also provides you with quick access to cure time charts and technical data of HammerHead pipe rehabilitation products. The Rehab Calculator from HammerHead® Trenchless is created for use with HammerHead CIPP and Point Repair systems and Picote™ Coating systems only.